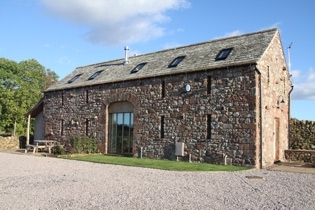 Two superb luxury self-catering holiday cottages created from a traditional agricultural barn on the outskirts of the peaceful village of Ousby, near Melmerby in the Eden Valley - an undiscovered part of Cumbria. The cottages, Corn Rigg Cottage and Rusby Barn are nestled below the North Pennines, an "Area of Outstanding Natural Beauty". A superb location for a peaceful retreat, with stunning open views across the Eden Valley. Our 7 day weather forecast for Penrith updated throughout the day, making it ideal for planning leisure activities, travel and events. Read more about our weather forecasts. On Monday 22nd April 2019 the sun will rise at 05:52 and will set at 20:27. It will be a mild day, with temperatures reaching around 17.9°C. Today is expected to be a dry day, with a very low chance of rain. It will be quite a breezy day, with a maximum expected wind speed of 20mph. On Tuesday 23rd April 2019 the sun will rise at 05:50 and will set at 20:29. It will be a mild day, with temperatures reaching around 15.3°C. Today is expected to be a dry day, with a very low chance of rain. It will be quite a breezy day, with a maximum expected wind speed of 20mph. On Wednesday 24th April 2019 the sun will rise at 05:47 and will set at 20:31. It will be a mild day, with temperatures reaching around 12.1°C. Heavy rain which could cause some standing water is expected, 11mm of rainfall is possible today. There could be quite a strong breeze in the air today, with a maximum expected wind speed of 24mph. On Thursday 25th April 2019 the sun will rise at 05:45 and will set at 20:33. It will be a mild day, with temperatures reaching around 10.8°C. Today is expected to be a dry day, with a very low chance of rain. It could be quite a gusty day today, with a maximum expected wind speed of 29mph. On Friday 26th April 2019 the sun will rise at 05:43 and will set at 20:34. It will be a mild day, with temperatures reaching around 9.9°C. Some moderate to heavy rain is expected, 5mm of rainfall is possible today. It could be quite a gusty day today, with a maximum expected wind speed of 30mph. On Saturday 27th April 2019 the sun will rise at 05:40 and will set at 20:36. It will be a mild day, with temperatures reaching around 8.5°C. A light shower is possible, 2mm of rainfall is possible today. Some quite strong winds are possible today, with a maximum expected wind speed of 37mph. On Sunday 28th April 2019 the sun will rise at 05:38 and will set at 20:38. It will be a mild day, with temperatures reaching around 3.8°C. Today is expected to be a dry day, with a very low chance of rain. It will be quite a breezy day, with a maximum expected wind speed of 21mph. Our weather forecast for Penrith is updated throughout the day and has been found to be very reliable for planning activities such as days out, leisure, travel, events, fishing, golf and gardening. Two superb luxury self-catering holiday cottages created from a traditional agricultural barn on the outskirts of the peaceful village of Ousby, near Melmerby in the Eden Valley - an undiscovered part of Cumbria. The cottages, Corn Rigg Cottage and Rusby Barn are nestled below the North Pennines, an "Area of Outstanding Natural Beauty". A superb location for a peaceful retreat, with stunning open views across the Eden Valley.